HOMAGE TO ALL PAST, FUTURE, AND PRESENT BUDDHAS. HOMAGE TO THE BHAGAVĀN, THE TATHĀGATA RATNAŚIKHĪ. HOMAGE TO THE BHAGAVĀN, THE TATHĀGATA VIMALOJVALANARATNARASHMIPRATIBHĀSAKETU (‘PINNACLE OF STAINLESSLY BLAZING RAYS OF JEWEL LIGHT’). HOMAGE TO THE TATHĀGATA JAMBŪSUVARṆADHVAJAKANAKĀBHĀSA (‘GOLDEN RADIANCE OF THE GOLDEN VICTORY BANNER OF PLANET EARTH’). HOMAGE TO THE TATHĀGATA SUVARṆABHASAGARBHA (‘ESSENCE OF RADIANT GOLDEN LIGHT’). HOMAGE TO THE TATHĀGATA SHATASŪRYARASHMIPRABHĀSAGARBHA (‘ESSENCE OF THE BRILLIANT LIGHT RAYS OF A HUNDRED SUNS’). (‘MULTILAYERED PARASOL SOURCE OF THE PRECIOUS GOLDEN MOUNTAIN’). HOMAGE TO THE TATHĀGATA CAMPAKAJVALANARASHMIKETU (‘CREST ORNAMENT OF THE BLAZING LIGHT RAYS OF GOLDEN FLOWERS’). HOMAGE TO THE TATHĀGATA MAHĀPRADĪPA (‘GREAT LAMP’). 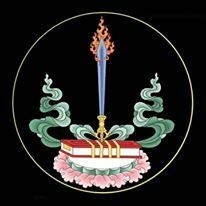 HOMAGE TO THE TATHĀGATA RATNAKETU, JEWELED CREST ORNAMENT. HOMAGE TO AKṣOBHYA, THE TATHĀGATA OF THE EASTERN DIRECTION. HOMAGE TO RATNAKUTIN, THE TATHĀGATA OF THE SOUTHERN DIRECTION. HOMAGE TO AMITĀYUS, THE TATHĀGATA OF THE WESTERN DIRECTION. HOMAGE TO DUNDHUBISVARA, THE TATHĀGATA OF THE NORTHERN DIRECTION. HOMAGE TO THE BODHISATTVA MAITREYA (‘LOVE’). HOMAGE TO THE BODHISATTVA RUCIRAKETU (‘PINNACLE OF BEAUTY’). HOMAGE TO THE BODHISATTVA SUVARṆAPRABHĀSOTTAMA, (‘TRANSCENDENT GOLDEN LIGHT’). HOMAGE TO THE BODHISATTVA SUVARṆAGARBHA (‘ESSENCE OF GOLD’). HOMAGE TO THE BODHISATTVA SADAPRARUDITA (‘EVER WEEPING’). HOMAGE TO THE BODHISATTVA DHARMODGATA (‘EXALTED DHARMA’). HOMAGE TO THE BODHISATTVA SUPRATISHTHĀ (‘CONSECRATION’). FROM THE SOVEREIGN KING OF SŪTRA TEACHINGS, THE TRANSCENDENT GOLDEN LIGHT, THIS WAS THE SEVENTEENTH CHAPTER: ‘VAST INCREASE IN WEALTH BY THE GREAT GODDESS ŚRĪ’. 1 Another edition appears to have SĀDYATHEDANA for SĀDYATHEDAN, UPASADAHITE for UPASAṄHITE, and SAMARATHĀNŪ for SAMARTHĀNŪ, but some of these may be printing errors.